Chason Disheroon joined the Baylor School of Music as Assistant Director for the Center for Christian Music Studies in March of 2019. His responsibilities include overseeing daily operations and planning for the Center's many annual events. He works closely with the Center's youth and intergenerational initiatives including: Worship Lab, Alleluia Conference, Music & Missions, among others. Mr. Disheroon holds a Master of Music in Church Music from Baylor University and a Bachelor of Music in Vocal Performance from Shorter College (Rome, GA). He is passionate about creating opportunities for worship leadership training and has been involved with the Center's programming as an auxiliary staff member since 2011. Mr. Disheroon serves as Minister of Music at Central Baptist Church (Italy, TX). 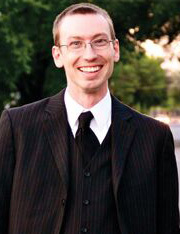 He also enjoys participating in events sponsored by the Central Texas Choral Society and Waco Civic Theatre. Mr. Disheroon is married to Nikita, an elementary music teacher in Waco. They have one son, Parker, and a mischievous cat, Leonard.